A mediator is a professional who helps resolve disputes between two parties. Possibly the most famous mediator of all time was King Solomon. Disputants who hire mediators are interested in coming to agreement without the time, energy and expense that a court trial might require. Mediators don’t actually decide how people will resolve a dispute. Their job is to get disputants to agree. Some mediators specialize in a certain area. Some handle a range of issues. Mediation practice areas exist in virtually all areas of the law. People frequently hire mediators in practice areas such as adult family, business, civil, commercial, construction, elder issues, employment, family, personal injury, online (ODR), probate, public policy, real estate and workplace. The volume of disputes needing mediation in any practice area closely reflects the volume of cases in any area of the law. For example, while mediators facilitate many divorce cases, the number of mediation cases in admiralty law, in any given year, may be tiny. Mediators work in different industries, but the highest concentration is in the legal services industry. State and local governments employ mediators as well. States with the highest employment for mediators are California, Texas, New York, Illinois, and Pennsylvania. Officially, it doesn’t take much to call oneself a mediator. In most states, requirements are low, sometimes non-existent, sometimes something as simple as taking a course on conflict resolution. That said, actually getting business as a mediator will take a lot more. Here’s a process for becoming one of the higher-paid mediators. The requirements for becoming a mediator varies greatly from state to state. Because there is no set path, at this stage in career development, the thing to do is decide what kind of mediator to be, and what practice areas are of interest. Take into account volume of cases (for example, divorce will be a high volume area, marine law less so), and whether that practice area requires highly technical knowledge. Students should major in topics of long-time interest, because these are the areas of specialty they may pursue as professional mediators. A pre-law major can be a great choice, but is not necessary for admission to law school. Good grades are very helpful for law school admissions. A bachelor’s will take approximately four years. Choose an accredited university as this will be important for law school admission. While not required to become a private mediator, the most financially successful mediators typically have practice experience as attorneys. In most states, this means they have attended law school. Note: several states will allow potential attorneys to take the bar exam without attending law school, but it is very difficult to gain employment as an attorney in these states without attending law school. Most law schools don’t require work experience before admission, though this can be helpful. Law school generally takes three years. To practice as an attorney in most states, students must pass a bar examination. This means the granting of permission by a court system to practice law in that system. Law firms sponsor many prospective attorneys during this time. Most states require passing examinations specific to that state. Ideally, the prospective mediator should enter a field of law practice that relates to the mediation practice they want to build. Use this time in practice to gain specialized credentials, study dispute resolution, and build a network in legal services. Law firm employers will often pay for continuing education, making this a good opportunity to expand expertise. Networking with other professionals is essential now, as well. Volunteering can also help build a network and expertise. Most attorney-mediators have been in practice more than three years. Requirements vary by state, so it is important to research requirements for every state in which a mediator wishes to practice. Many different providers offer classes, including non-profit and for profit seminar providers. If already practicing as an attorney, look for CLE (continuing legal education)-approved classes to take care of attorney practice requirements at the same time. Self-employed mediators must constantly continue to build their practices. Look for online opportunities to list services, attend local bar events and meetings, volunteer, and network. Working with disputing parties, mediators seek to understand the dispute from all different perspectives, and then help the parties come to a resolution. In practical terms, this can mean interviewing disputants individually, meeting with them together and sometimes performing some primary research into the issue under dispute. Disputants seeking mediation may be coming to mediation voluntarily or because a judge issued an order. The mediator’s role is to facilitate negotiation and resolution. Mediation will end if the disputants cannot come to a resolution. Agreements reached in mediation are not always binding. Mediators generally do not have formal licenses. However, requirements to be a mediator vary region by region. For example, in the District of Columbia, mediators of civil cases, other than family disputes, must be an attorney. States with mediation programs sponsored by the judiciary or other branches of state government may require mediators in these programs to meet certain requirements. In many areas, requirements are not always rigid or formal. In fact, an important theme in mediation is for parties to have some element of free choice in seeking mediation. This allows the disputing parties to choose mediators who are trusted or may have specialized expertise in the issue under dispute. Private and court-appointed mediators have different roles and responsibilities. These mediators work outside the court, and generally may not deal with the court in any way. Unless they are an attorney, they may not file paperwork or provide information to the court. Court-appointed mediators do engage with the court system, sometimes making recommendations to judges. Becoming a court-appointed mediator often requires first being an attorney or meeting other requirements. Mediators are typically trusted individuals, with documented work experience and strong local reputations. Since mediators deal extensively with legal matters, they are often attorneys before they become mediators. Becoming a mediator is generally not an option for new college or even law school graduates. This is because most mediation practices are built by reputation and word of mouth. Gaining mediation work full-time can be a challenge. As neutral parties, most mediators are self-employed, which means accepting the pressures, inconsistencies and rewards typical of self-employment. What Does an Average Day For A Mediator Look Like? Mediators typically work in office settings, with office hours. Yet because disputants may work during days, a mediator’s day may include some evening and even weekend meetings. For example, a divorce mediator may need to meet with disputants after standard work hours. A mediator’s day is often meeting-laden. A mediator may meet individually with disputants or other experts, and may meet with both disputants at the same time. Mediators ask many probing questions and do a great deal of listening. When a mediator accepts a case, the first thing is to learn everything possible about the situation. This may mean reading statements, transcripts or other documentation. It will often include phone or live meetings. These meetings may be with individuals or both parties. The mediator’s goal at this stage is to understand the basic dispute and the goals of the parties. Most mediation formally starts with a meeting aimed at dispute resolution. From the disputant perspective, a single meeting where they sort through the issues and come to agreement is an ideal outcome. Such a meeting may last many hours. In some cases, such as an amicable divorce, it may be the only dual-party meeting the mediator has for a case. For the amicable divorce example, a separating couple would work with the mediator to agree upon child custody and asset division. In this example, the mediator would come to the meeting with a long list of questions about the situation, including job situations, income, children’s ages and needs, schedules, assets, investments, future plans, and more. Even if a couple believes they have thought of and discussed everything, a mediator may assist by helping them work through issues they may not have considered. Sometimes meeting with disputants individually is necessary. Emotions may be high, making it impossible for disputants to be in the same room and stay rational. In this case, the mediator holds individual meetings, asking many questions and probing deeply into the situation. In some situations, a mediator may end up describing how the law works, helping a disputant understand how it may affect their situation (however, they do not give legal advice). The mediator’s goal is to help each disputant come to agreement, not to make a decision for either party. Providing neutral, practical feedback and information is one tool a mediator uses to diffuse frustration and move the matter closer to resolution. Increasingly mediators write diagnostic reports. These reports can describe areas of agreement, areas of continued disagreement, open questions affecting the situation and even suggestions for future process for resolution. In private mediation, diagnostic reports are not an automatic part of mediation and are generally agreed upon in advance of hiring a mediator. They can be a very useful tool for all parties, as they succinctly lay out the situation, providing the parties with a neutral written document that can be referred to as their process of dispute resolution advances. Private mediator-written reports are not provided to courts however, court-appointed mediators may find themselves making recommendations to judges. Mediators are often self-employed. This creates the need to continually market the mediation practice in order to gain new clients. Marketing activities include everything from handling inbound queries to networking with other professionals to establishing an online business presence. Practice building activities will vary based on the practitioner’s situation and goals. Practice building can be time intensive and delivers no immediate paycheck for the hours spent. It is important to take this economic factor into account when planning to develop a mediation practice. One of the most important practice building activities is to promptly and effectively handle inbound queries. Disputing parties are stressed and anxious. Their potential mediator needs to explain the expertise they offer, the mediation process and any associated fees in a direct and positive manner. Engagement might require emailing a simple agreement, detailing to each party what to expect, providing a checklist of materials for disputants to bring to mediation, and scheduling meetings. All of this time consuming activity must happen pre-fee, so it is essential for the mediator to have an efficient, consistent method of engaging potential clients. In any referral business, networking is essential. Mediators must let other legal services professionals know they are open for business and eager to serve. Of course, networking is highly personal, depending on what works for any individual. Often legal professionals network through bar association and specialty area meetings and conferences, continuing education, and performing pro bono (free) services. While requirements for becoming a mediator are low, getting business as a mediator requires establishing and continually extending expertise. This expertise needs to be in both dispute resolution and any practice areas. Mediators must find ways to gain expertise (sometimes through continuing legal education aka CLE), or other classes. Establishing expertise publicly can take many forms. One of the simpler ones is to have a practice website that includes some content on areas of specialization. Another strategy is to teach courses in dispute resolution. Still another is to write for publication on practice areas and conflict resolution. Some mediators pay for listings in directories and use reviews in their websites. How a mediator establishes their expertise among other legal services providers and potential clients will vary with region, expertise, goals and inclination. 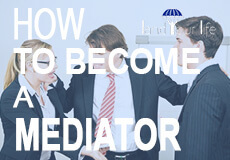 Are You Suited for A Mediator Career? Being a mediator demands the ability to understand the law and how it applies to one’s areas of practice. The most financially successful mediators have prior experience practicing law, which means acquiring a JD. Pursuing a law degree prior to becoming a mediator means committing to about seven years of post-high school education. Becoming a mediator also requires specialized training through continuing legal education and other seminar programs. Mediators must be neutral parties in the mediation process. Clients are seeking mediation in emotionally challenging situations. Regardless of how unreasonable or upset clients seem to be – or what a mediator’s private opinion is about the client situation – the mediator must maintain neutrality at all times. All core communication skills are necessary for the successful mediator. Mediators must be great listeners, able to let clients speak their piece. Additionally, mediators must be able to ask probing, clarifying questions, separating opinion from fact and really understanding each disputant’s position and goals. Mediators are excellent presenters and talkers. Though the setting is often a small one, with only several people in a meeting, mediators still must be able to explain issues and situations concisely and clearly to all parties, and sometimes to judges. Mediators must be able present information in a way that gains agreement and builds confidence and trust. Mediators are able to write detailed, neutral diagnostic reports as well as recommendations. They are able to state the fact basis for their opinions, assess the situation and convey information in a useful way. Mediators weigh into messy situations and are tasked with sorting fact from opinion, articulating the situation so that the parties can come to agreement, or so that a judge can make a determination. Sometimes they are required to apply complex analysis based on technical knowledge or research. Mediators can’t force agreement or make decrees. This can be frustrating for people who quickly determine their own opinions and want others to fall in line with their determinations. Successful mediators have a genuine interest and patience for conflict resolution; they are committed to helping their clients move forward by being in the process with them, step-by-step. Mediators can make a good living, but are not highly paid compared to other legal professionals. Additionally, they’re often self-employed, so income can wax and wane. Mediators are expected to be trustworthy and in good standing within their communities. Those with criminal records or high profile problems may not get a lot of referral business. Mediators must be able to be discreet, respecting the privacy of their clients. Most professional mediators would recommend that new mediators take a comprehensive conflict resolution course as a start. A typical course would be a week-long, 30-40 hour event. These are offered by private seminar companies, online universities, and continuing education programs. Continuing education with training in specialty practice areas is also advisable. That said, requirements for mediators are inconsistent state-to-state, and vary based on private or court-appointed mediator status. Most successful court appointed mediators were previously attorneys, and these have the highest earning potential. How Does A Mediator Find Work? Building relationships with other legal service professionals delivers mediators most of their business. Networking is done through office relationships, participating in state bar events, community service and pro bono work. The busiest mediators are ones that choose practice areas with a great deal of volume (such as divorce). Prospective mediators should list their businesses in mediation and legal directories, and have basic websites describing their services. A popular site to explore is Mediate.com. Teaching seminars, writing articles, and blogging are ways to educate and inform potential clients while establishing domain experience. What is the Average Salary Of A Mediator? According to the Bureau of Labor Statistics (BLS), the median annual wage for arbitrators, mediators and conciliators was $60,670 in 2017 ($29.17 per hour). Wages have wide fluctuation based on geographic area, area of expertise, and practice marketing. Job growth estimates for mediators, arbitrators and conciliators are average. While the demand for mediation is growing (because it is less costly than trials), state budget constraints affect the pace of growth. The BLS estimates the job outlook from 2016-2026 is 10% growth. The number of jobs will grow from 7800 to 8600 in this period. Related professions are arbitrators and conciliators. Mediators are often practicing in the field as a second or adjunct career. They may have been attorneys or business professionals with specialized expertise. Retired judges are attracted to mediation. Mediation Training Institute (MTI) offers information, courses and a directory for certified mediators. Mediate.com has a robust site, including a directory and job related information. A list of international mediation organizations can be found here: www.mediate.com/Organizations. Association for Conflict Resolution (ACR) focuses on enhancing the practice and public understanding of conflict resolution. The American Bar Association has a Section of Dispute Resolution, as do most state bar associations. Well-regarded centers for Online Dispute Resolution (ODR) are OnlineDisputeResolution.com and the National Center for Technology and Dispute Resolution. Mediation stemmed from the California courts via local nonprofits to reduce cost and time for the public. It was designed ‘for the people, by the people’ based in human behavior and understanding for resolution. It was once a powerful same-room experience (afterall, that is where the skill is demonstrated by the practitioner). Unfortunately, the field has evolved into a court-variation. Separate room talks should be labelled negotiations — not mediation.